The Accessibility Summit, an online conference on accessibility, took place earlier this week. The event is presented by the good folks at Environments for Humans (@e4h). The event was one day in the past few years but was extended to two days this year! If you attended or not, take a look at the great information in the Twitter stream using the hash tag #a11ySummit. Web Axe author Dennis Lembree spoke on usability and accessibility CSS gotchas. He will give a similar talk this fall at Accessing Higher Ground and CSS Developer Conference. 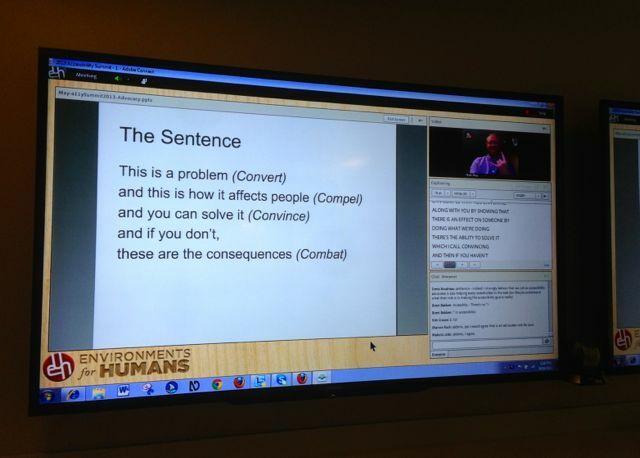 The sentence slide by Matt May. TalkBack & Magnification Accessibility in Android 4.3+ by Paul Adam (@PaulJAdam). Keyboard and Interaction Accessibility Techniques (Slideshare) by Jared Smith (@jared_w_smith). CHANGE is not a four-letter word (PDF) by Kimberly Blessing (@obiwanKimberly). Accessible Video in The Enterprise (Slideshare) by John Foliot (@JohnFoliot). Web Axe was nominated for "Podcast of the Year" in .net magazine's 2008, 2009 and 2010 Best of the Web awards. To learn more about Dennis Lembree, the founder and main host of Web Axe, visit his web site at www.DennisLembree.com.